#Sealink How did you find the ciabatta? I've had that a few times, twice it was tasty and enjoyable and twice it was overdone and dried out. It was very tasty, and the ciabatta was soft. But I really need to cut down on the bread so it will be the chicken slices for me in future. Afternoon tea flight. Medium band with Muslim meal. It was very tasty and will order again. Could you say a bit more about what it was? I see a sort of yellow tabulleh/couscous but the rest is not obvious. The yellow stuff was couscous, brown was a lentil/bell pepper mix. The triangles were halloumi. And fruitcake for dessert. It sure beats the two tired looking finger sandwiches everyone else got. Interesting - I would have guessed the triangles were tofu, as they look very similar to the slices that used to appear regularly in the VGML/VLML salads. Halloumi is probably a lot more expensive to source and prepare, which seems to buck the penny-pinching trend! It does not and shouldn't be relied upon to be so. You might be sorely disappointed. Chicken has made an appearance on many a Muslim meal. Of course they will try to consolidate this some so that they aren't preparing so many meals, so it may be vegetarian, but certainly not guaranteed so. For the first time since Club Europe was introduced on domestic flights, I found myself aboard a morning flight from MAN that fell within the the Breakfast catering band. This is an early morning flight that falls within the 'Breakfast' catering band. This was an A320 service with 16 CE passengers spread across 6 rows. There were 3 crew in CE and 2 crew looking after the ET cabin. LHR flights to and from MAN and LBA are in the express catering category (service times of less than 22 minutes). Hot towels were offered on the ground. As is typical on these flights, the crew were on their feet within 60 seconds of takeoff. Meals and drinks were served together seat-side from a single trolley. Two crew offered the tray and asked if we wanted 'tea, coffee or juices' as mentioned in another topic. There was no champagne on top of the trolley, which appears (IIRC) to be a change from the previous CE breakfast SOP. A champagne was ordered as was a G&T and the crew member went back through the curtain to order the same from the CSM. Drinks appeared at the same time as the food. The tray offered to all passengers contained a fruit plate, yoghurt with fruit compote, a bacon roll was offered together with warm bread, croissants and preserves. Once the meal service had been completed more drinks were offered and the bread basket was passed through the cabin again. Over all an excellent, happy service from this mixed fleet crew. I found this breakfast offereing perfect for the time of day and length of flight. The bacon roll was loaded with two rashers of very good quality back bacon and a delicious sun-dried tomato relish. I did think it was a tad small at first sight, but the reality was that it was just about right. The fruit was fresh and sweet and the yougurt compote pleasant. For the MAN/LBA flights this is just right, another well done to BA on this domestic CE product. The AVML (Asian vegetarian) and Muslim meal have the same core dish judging from the photo above. So that seems to be the way forward there for you, order AVML. I suppose it is ha'lal, nevertheless Muslims seem to have gotten the wrong end of the lowest-common-denominator game here. Well by all means report back. As shown upthread and via the wiki, the supper options will more likely be the cold salad or the panino. I was under the impression that domestics do not get a special meal selection, the exception being LGW-JER where special meals can be selected. That's why it is greyed out accordingly on MMB. If you do get a special meal via the Contact Centre please let us know. Aah - I didn't have access to MMB at the time so didn't even realise this was greyed out. (Hence why I was baffled at what I thought was a straight forward request). After the second call, myflights updated immediately with the meal request, and when I later managed to access MMB it was showing in there too. 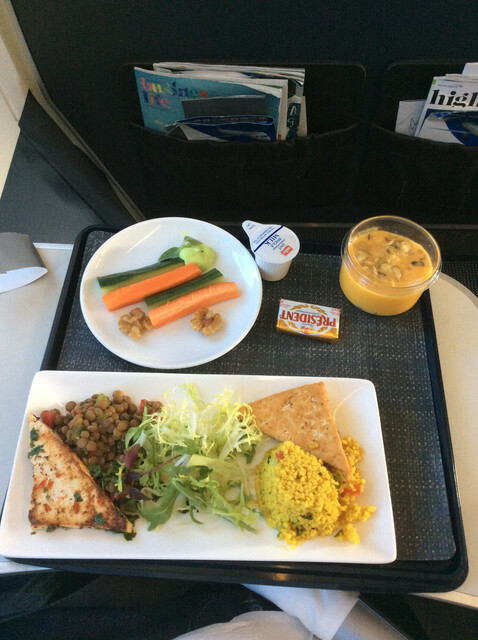 On the flight I received the vegetarian sushi meal (the same as in post 710). Very tasty and perfect for such a short flight. Thanks for the confirmation. It turns out that the "greying out" is an error which BA will be fixing shortly. I'll update the wiki over the weekend so that people know that domestic do in fact have special meals, but the current workaround is to set the BAEC preferences to the special meal and then it cascades over. I was quite impressed with the CE offering on MAD-LHR, where the actual flying time was 1 hr 50 min. Consisted of a cold salad of 3 slices of chicken, a tablespoon of coronation chicken, 1 large prawn sitting on some sort of (? cucumber) coleslaw, a bit of lettuce and a half cherry tomato. The warm bread roll accompanied it well. The tray also contained a cheese plate that contained a single piece of Stilton, single oatmeal biscuit and some chutney. There was also a tiny but adequate dessert (cinnamon apple crumble). Overall, i was not hungry afterwards and it was a lunchtime flight. I do prefer the previous system of giving out individual 1/4 bottles of champagne rather than the current system of pouring from a large bottle. Under the old system, on a flight of around 2 hours, I would happily have enjoyed a couple of 1/4 bottles (and rarely a third one if my wife wasn't looking) but under the new system, with in excess of 50 passengers to serve on a 777 (both CW and F cabins used), I only managed 1 glass of champagne that was served just before my meal. No water was served nor were there any top ups of drinks. The crew were working hard so I think this was due to high volume of passengers. I did pop to the galley and get a second glass as the captain announced 40 min to landing. Serving champagne from the full bottle may look more 'premium', but I think overall, BA will save more money this way as customers simply won't have the opportunity to drink as much as before. This is exactly what I had on my recent flight from MAD. Woeful portions and not impressive at all IMO. The Iberia offering is much better based on my recent experience. Wouldn't have said that a few years ago.